Utility type vehicles are prominent pieces of equipment utilized in a variety of settings. The hauling features offered by UTVs have increased their popularity, availability, and use in work-related tasks in rural, suburban, and urban areas. Because of their hauling capabilities, they are helpful vehicles in residential, agricultural, construction, and industrial settings. 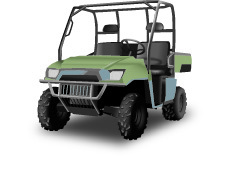 There is a category of vehicles related to UTVs, with similar features and appearance, which is designed primarily for recreational use and known as recreational off-highway vehicle (ROVs). Both UTVs and ROVs have also been referred to as "Side-by-Side" vehicles. These vehicles can have four or six wheels and are powered by diesel, gasoline engines, electric or a hydrogen fuel cell. UTVs were designed for work purposes. Most models include a bed to enable the hauling of feed, mulch, or other supplies, which makes them convenient transport for small jobs. These utility type vehicles are available from multiple manufacturers and in a variety of models. Utility type vehicles have a steering wheel, acceleration foot pedal, and a brake foot pedal. In addition, these vehicles are designed to carry passengers. Most UTVs have side-by-side or bench seating and are equipped with a seat belt for the operator and passenger. An occupant protective structure, which commonly includes a system of tubular bars, surrounds the space where the operator and/or passenger are seated. Other protective features could include: hard plastic doors, sturdy canvas netting, or handholds. Utility type vehicles by design are to be "driven" while ATVs are to be "ridden." In accordance with the Ohio Revised Code [(4501.01 (B) & (VV)], a utility type vehicle is not a motor vehicle but a self-propelled vehicle designed with a bed for the primary purpose of transporting cargo. The utility type vehicle is also not classified as an All-Purpose Vehicle (APV), which are required to be titled in the state of Ohio. To safely operate a utility type vehicle, the operator must use similar safe work habits as used with tractors, skid steer loaders, and ATVs. A safe, successful driver should become familiar with the machine before using it. This can be done by reading the owner's manual and following safety labels found on the vehicle. A qualified operator (sales person) can also demonstrate the correct operation. Keep legs and arms inside the vehicle at all times. Drive slowly and turn smoothly to avoid an overturn. When hauling cargo the vehicle's center of gravity is raised, increasing the chance of overturning. Drive completely up or down a slope or hill before making a turn. Do not turn the vehicle in mid-slope or hill as this increases the probability of overturning. Use the appropriate speed on rough terrain. Operators and passengers have been thrown from vehicles. Stay clear of ditches and embankments. Passengers must be tall enough to reach handhold while their backs are against the seat and their feet are flat on the floorboards. Each passenger must ride in his/her own seat, not anywhere else on the UTV. Operators must back up carefully. Look especially for children before backing. Operators should be free from the influence of drugs or alcohol. Due to the hauling purpose of a UTV, special attention should be paid to making sure cargo or material is properly secured during transport. Since UTVs are often used to tow implements, it is important to follow safety practices when towing a load. When towing a load, make sure the cargo box is loaded to assume good traction for driving and stopping. Be sure to tow load at a speed slow enough to maintain control. Remember, the stopping distance increases with speed and weight of a towed load. Follow the manufacturer's recommendations for weight limits for towed equipment. The safety practices, listed above, are recommendations of how to safely operate a UTV. As with all machinery, use the UTV as designed. Utility vehicles are tools, not toys and following the recommended safety practices will help ensure an enjoyable experience for both driver and passenger. ROVs are the recreational variant of Side-by-Sides. The same operational instructions and safety rules apply in a general sense. But since recreational use may occur at higher speeds and on more challenging terrain than utility use, the operator must be especially cautious and operate the vehicle at speeds appropriate for the terrain, use extra care in turning and crossing hills, avoid stunt-riding, and never operate under the influence of alcohol. Recreational use requires operators and passengers to wear a helmet and other protective gear, use the seat belts, and keep all parts of their bodies inside the ROV. A number of crashes, rollovers, injuries, and fatalities have occurred because ROV drivers have violated these common sense rules and driven aggressively. This fact sheet was reviewed by Randall Reeder, P.E., Assoc. Prof. and Extension Ag. Engineer, The Ohio State University; Kent McGuire, Program Coordinator, Agricultural Safety and Health, The Ohio State University; Doug Morris, Ohio 4-H ATV Safety ASI Instructor; Tom Yager, Vice President Safety Programs SVIA/ROHVA; and Ken Glaser, Director, Special Projects, SVIA/ROHVA. John Deere Gator Utility Vehicle TS and TH 6x4 Operator's Manual. John Deere Publishing, 2004. ATVs and Utility Vehicles—HOSTA Task Sheet 6.2, National Safe Tractor and Machinery Operation Program, The Pennsylvania State University, 2004. Recreational Off-highway Vehicle Association, 2008. rohva.org.